The custodian has yet to taste defeat for his new club since joining in the summer from SC Freiburg, and a run of nine Bundesliga games unbeaten is a new experience for him, as is being fourth in the standings on 17 points at this stage of the season. They have arrived there after a hugely impressive start to 2014/15 and earned their fourth victory of the campaign in a hard-fought 1-0 triumph at home to SC Paderborn on Saturday. The issue now occupying both fans and pundits is whether they will be able to stay there over the course of the season. 1899 head coach Markus Gisdol may not be a fan of that line of inquiry, but it is a justifiable question. Last term Hoffenheim scored 72 times but conceded a league-high 70, earning them the moniker of the ‘Bundesliga entertainers’. Since then Gisdol has worked on tightening the defence and the result on Matchday 9 was their fourth clean sheet this term, while only the top two of FC Bayern München and Borussia Mönchengladbach have conceded fewer than Hoffenheim’s seven goals. The desire to put on a show has been replaced by a more cold-blooded quest for points, with the side now able to eke out narrow victories in trying fixtures. The 22-year-old, who is currently sporting a full facial beard that he will only shave off once Hoffenheim lose, did give an insight into the levels of confidence running through the club. 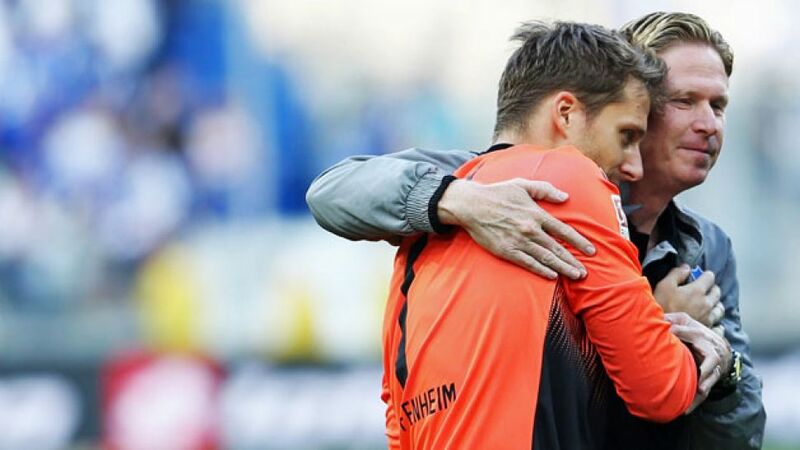 Even so, Hoffenheim’s brush with relegation two years ago has left everyone at the WIRSOL Rhein-Neckar-Arena wary of getting ahead of themselves. Slowly but surely, however, outsiders are beginning to take note of developments at Hoffenheim. Volland has been called up to the senior Germany side by Joachim Löw, while playmaker has been included in the Brazil squad for the first time, and will join up with the Seleção for their friendlies against Turkey and Austria in November. “It is possible, then, to become a German or Brazilian international at Hoffenheim,” said TSG sporting director Alexander Rosen, beaming with pride. Ironically, neither Volland nor Firmino have been at their best this yet this season, which nevertheless bodes well for the club. A new-found ability to gain an edge in tight games, an improved backline, exciting attacking players and a grounded coach holding everything together: it seems Hoffenheim have what it takes to establish themselves as a Bundesliga powerhouse.